Sofortbuchungen für Samstag bis Samstag NUR. Senden Sie uns vor der Verwendung von Instant Booking eine E-Mail, wenn Sie an anderen Terminen als Samstag Check-in-und-out-Termine benötigen. Neue Möbel. Gorgeous direkten Blick auf den Golf von Maravilla 2403, oben (4. Stock) so tolle Aussicht und nur wenige Schritte zum Aufzug oder Treppen. Alle meine Einheiten haben Queen-Schlafsofa im Wohnzimmer. Zu den Annehmlichkeiten gehören eine voll ausgestattete Küche, alle Bettwäsche, Waschmaschine / Trockner in der Einheit. Flachbild-Fernseher in Wohn-und Schlafzimmer, DVD / VCR und Stereoanlage. Wir sind tierfreundlich und unsere Einheiten sind rauchfrei. Maravilla Ausstattung: 2. 5 Hektar großen Privatstrand, 2 Pools (1 saisonal beheizt), Whirlpool, 2 Tennisplätze, Shuffleboard, Fitnessraum, Clubhaus, BBQ Grills an beiden Pools und einen großen Parkplatz. Dies ist ein Familienkomplex mit viel Grün zum Spielen. Fordern Sie zusätzliche Informationen, Preise und andere Eigentumswohnung Standorte und Verfügbarkeit. Master-Bad verfügt über Wanne / Dusche-Kombination. Guest Bad hat Dusche. Voller Größe Waschmaschine / Trockner in Wohnung, ## Ein Strandschirm-Service und 2 Liegestühle zur Verfügung gestellt täglich (saisonal). ### Ein kostenloser Highspeed-Internet WIFI. 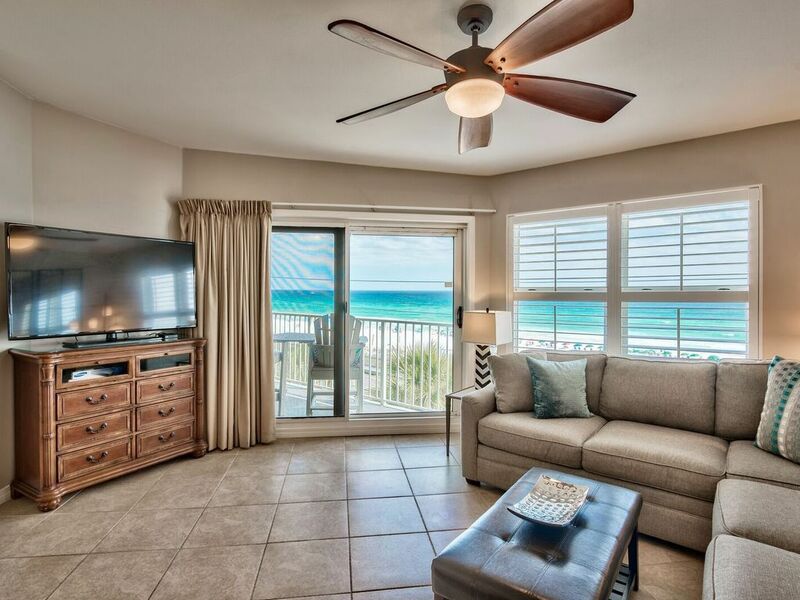 Beautifully decorated condo with very comfortable beds and great views. Love the grassy area for pets. The owner provides many extras to make your stay special. All bedding and furniture is high end, and the location is wonderful. We will definitely be back! Great condo with beautiful view. This condo was nice, clean, and close to the elevator. The patio facing the ocean was made even better by the padded lounge chairs. The walk to the beach is short and crossing the road is no big deal. This top floor unit was very quiet. The only thing that was difficult for us was the king bed was too soft but that may not be a problem for all. It is nice to have a pet friendly option so close to the beach. My family loved our say and we were able to recharge our batteries. Loved the condo and the view was perfect. In der Nähe von Pompano Joes Crab Trap und Restaurants, Silver Sands Outlet, Destin Commons, Harbor Walk Village, Sandestin, Destin Harbor, Einkaufen, Angeln, Restaurants, Unterhaltung. Initial payment of $400 to reserve/$500 for monthly reservations. 50% balance due 30 and 60 days before check in. Credit Card info must be provided in lieu of damage deposit. Pet Fee of $50 small pet, $100 large, per stay/week. A 90 day notice is required for cancellations. 120 day notice for monthly rentals. We highly recommend trip insurance and can be purchased when you make your online reservation payment. For more information about trip insurance go to: vacationprotection.com Reservations are weekly/Saturday to Saturday. Less than 7 nights with owner permission and only during slow seasons. Not responsible for typos.